We hope you have enjoyed some of the stories of the early days of UTU from Chris and Laurie. This week we are grateful for the contribution of Tony Holden. He takes us through his involvement with UTU from the 1970s onward. I knew of UTU from about 1976 when UTU students came to Bow Mission in east London. Later I went on courses where I appreciated John Vincent’s Gospel teaching; the eucharists in the library; and the emphasis on church alternatives. When I worked for the national Methodist Church we often cooperated together. In amongst our committee work, seminars and workbooks, there were public highlights such as work with ‘Action for Children,’ the publication of ‘Cities’ in 1997 and ‘the Petition of Distress to the Queen’ in 1993 (See photograph below). I remember staying in David Dale’s home, the friendship of John and Grace Vincent and their example of Christian living. Those working at UTU and those visiting from around the world made it a place of rich and diverse encounter. Much of my post-University learning and teaching about ‘the Jesus of the Gospels’ was sustained and developed by being part of the UTU community. 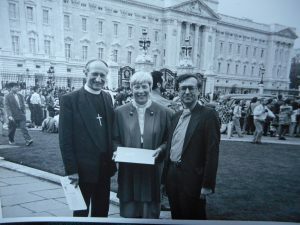 My ministry aspired to be ecumenical, interfaith, and community-based and UTU fed much of what we attempted in East London. This gave me a radical model, which I was able to draw on in my role for the Methodist Church working as Urban Mission and Mission Alongside the Poor Programme Officer. This radical model was only matched in its creative energy by broad based community organizing. 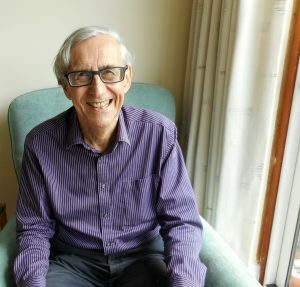 I am indebted to John Vincent, that for all his huge publishing success he was one of those who took the time to encourage me to write and edit in my own way. I retired in 2003, and Barbara and I now live in Loughton, an edge-of-London commuter town, and belong to a suburban church!!! We continue to strive to be faithful; to find alternatives; to live with difference; to give attention to the Jesus of the Gospels; to seek peace and justice for all.